The POS-X EVO-BS1 barcode scanner offers retailers an affordability and great scanning capabilities, ideal for boutiques, clothing shops, or any lower volume scanning environment. The lightweight design and strong linear imager ensure the EVO-BS1 will perform well for many years. 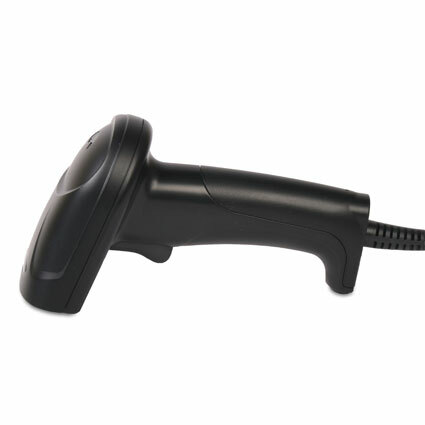 As a linear imager, the EVO-BS1 can read retail barcodes from nearly 10 inches back, excellent for minimizing training and streamlining scanning operations. A scan speed of 130 scans per second provides the quick, accurate reads necessary to eliminate data entry errors and keep lines moving smoothly. POS-X built the EVO-BS1 to handle the abuse that occurs even at rough retailers. The lightweight design of the scanner and lack of moving parts protects it from drops of over 6 feet, extending the life of the EVO-BS1 tremendously. POS-X ships the scanner with a 3 year advanced replacement warranty standard, and additional Rapid Replacement warranties are available, giving you greater peace of mind for your investment. Dimensions (W x D x H): 2.9" x 3.6" x 6.9"